Dr. Dan Holliman, now deceased, spent more than 18 months on daily walks at the Gardens as therapy from knee replacement surgery. During that period of time, the retired Birmingham Southern Biology Professor filled a notebook with data on the gardens' abundant bird life. His log of 89 different species was the basis of the birding program at the Gardens. He and Dr. Vasha Rosenblum, Children's Education Coordinator, placed bluebird houses around the Gardens and created "The Guide to Native Birds at Aldridge Gardens" so more people could watch the birds. So, if you are interested in bird watching, pick up the guide the next time you visit the Gardens and enjoy our feathered friends. 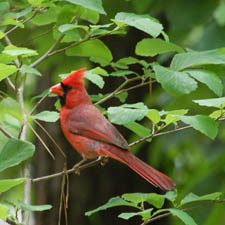 Aldridge Gardens is a kaleidoscope of natural habitats for birds. More than 90 species call the Gardens home, or at least a favorite place to visit. Led by Dr. Richard and Patricia Ryel, these walks are a wonderful opportunity for members to get started with birdwatching as a hobby. Bring along your binoculars and field guide, then meet in front of Aldridge House and step out and see the Gardens like you never have before! Because walks are limited to 15 members each time, reservations are required. It is a hobby one can pursue at any age, at any time and at any given place. All you need is a pair of binoculars and a field guide for birds and you are ready to take part in one of the most popular outdoor activities on Earth.